But officials from the city of San Diego, the Port of San Diego, San Diego County, the Metropolitan Transit System, the San Diego Association of Governments, the California Coastal Commission, the California State Lands Commission and the state Department of Transportation submitted stern – at times exasperated – letters opposing the airport’s approach. The opposition could derail the project, and has revealed massive disagreement over the best way to improve the airport’s connection to transit and deal with its continued growth. The agencies aren’t opposed to the project itself, which would expand the terminal from 19 to 30 gates, build a large parking garage and add the dual-level pick-up and drop-off system seen at Terminal 2. The agencies agree increasing the number of people who can fly into and out of San Diego from a modernized and welcoming facility is a great idea. It’s how the airport has dealt with the project that has drawn the hackles of the airport’s would-be partners. The agencies expressed their opposition as formal responses to the airport’s environmental impact report. To the extent that wonky response letters issued as part of the California Environmental Quality Act process can express frustration and dismay, these do. They’ve got a lot of overlapping complaints. The biggest one is over their contention that the Airport Authority is about to dump a big, expensive problem on their laps, while it reaps all the benefits of a bigger, more profitable airport. That’s because the Airport Authority has determined it can’t pay for all the needed improvements to deal with more travelers, because the Federal Aviation Authority restricts how airport revenue can be spent off airport grounds. They’re concerned the plan doesn’t do enough to fix the airport’s poor connection to public transit – and there’s a heavy undercurrent of resentment that the airport has for too long not cared to address that weakness. There are complaints about the airport’s failure or refusal to communicate with its neighboring and overlapping jurisdictions and with its willingness to pass the responsibility of dealing with problems off on those same neighbors. The airport, for its part, can’t seem to understand where all the criticism is coming from. Airport Authority spokesman Jonathan Heller responded to VOSD’s questions only in writing. The Airport Authority, he wrote, is ready to collaborate on any issues, as always, but FAA rules bind its hands on certain things. None of the letters are timid, but by far the most outspoken is from the Port, which leases the airport property to the Airport Authority. Its letter is 1,229 pages and reads more like a combative lawsuit than a technical response letter. This is the third public confrontation between the Port and the airport this year. In the spring, Assemblywoman Lorena Gonzalez introduced legislation to give the Port final authority over the airport, undoing 2003 legislation that made the Airport Authority a standalone entity. The Port’s public statements made clear it didn’t hate the idea. But Gonzalez relented, amending the bill to kill the idea. Then the Airport Authority joined a lawsuit against the Port, enraging leaders at the Port and in the South Bay. The Airport Authority later backed off. Now there’s a standoff over the Airport Authority’s responsibility and ability to pay for public infrastructure improvements near the airport. But the Port isn’t the only local agency with pent-up animosity for the Airport Authority. The crucial issue at stake is whether the Airport Authority can spend revenue it earns from running an airport on infrastructure improvements that aren’t on airport property. The Airport Authority says it will ask the FAA to let it spend money on off-airport infrastructure upgrades – like improving bus service to the airport, upgrading the sparse trolley connection that exists today, adding new freeway off-ramps and refining local intersections to better handle traffic. Since the FAA regulates that spending, as far as the Airport Authority is concerned, none of those projects is viable until the FAA says so. The other agencies don’t disagree. They think the Airport Authority should have done more to get FAA approval before it pursued an over $2 billion project that, according to the airport’s own analysis, will cause traffic problems around the airport that need to be addressed with increased infrastructure spending. Until that FAA approval comes in, though, the Airport Authority’s report is clear: Those projects are “infeasible.” They aren’t happening. But because the Airport Authority deemed those improvements infeasible in its report, the Airport Authority isn’t obligated to build them. It can promise to pursue them, but it won’t be legally bound to do so. It could, theoretically, build the Terminal 1 expansion and not be forced to pay for the associated improvements. In its letter, MTS accuses the airport of routinely building projects and relying on its neighbors to deal with the effects. The Port likewise says the airport is free-riding, and its project will just mean the city, CalTrans, SANDAG and MTS foot the bill for the airport’s expansion. And the county, which operates other airports and works with the FAA, was flummoxed. The Airport Authority has itself received FAA approval for off-site improvements before. Earlier this year, the FAA gave it permission to spend $6 million on traffic signal improvements at Sassafras Street. But the agencies’ outcries could already be delivering results. San Diegans and visitors routinely grouse that the region’s trolley system doesn’t extend to the airport. That complaint, and improved transit to the airport generally, have become a big issue within the Terminal 1 project. In their letters, the surrounding agencies chastise the Airport Authority for its lack of urgency in forging airport-transit connections. Right now, there is a little-known, uninspiring (at best) trolley connection. Fliers can take the trolley to the Middletown Trolley Station, walk across Pacific Highway and use shuttles coming and going from the airport’s rental car facility to get to the terminals. MTS said that service is “unsuccessful” because it’s confusing, uninviting, the shuttle service is infrequent and the area feels unsafe after dark. It asked for “greater effort and a longer-term commitment” from the Airport Authority on the connection. The Coastal Commission agreed, calling it “not what was required or envisioned” when the connection was mandated as part of approving the rental car facility. The list of requested transit improvements doesn’t stop there. 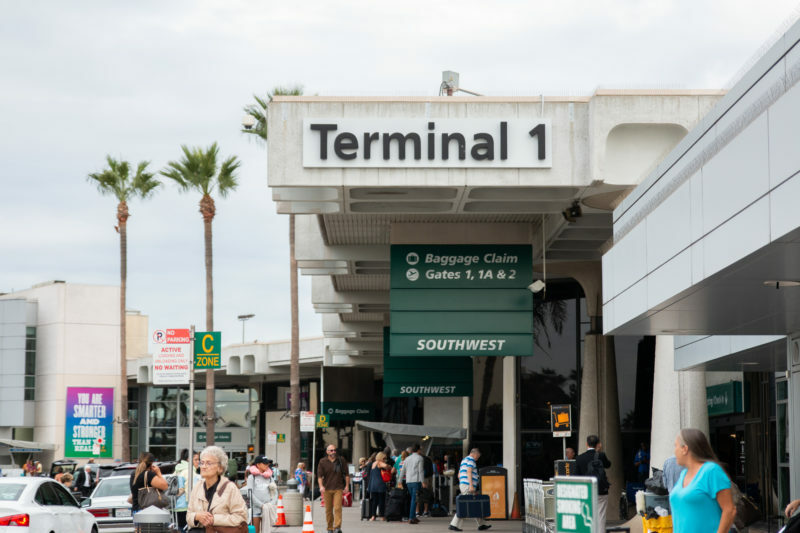 SANDAG asks the Airport Authority to help pay for environmental studies for the “Intermodal Transit Center,” an unfunded project in the region’s 50-year transportation plan that would build a new trolley and bus station north of the airport. The airport pledges in its Terminal 1 plan to connect the terminals to the transit center between 2030 and 2035. As far as it’s concerned, since the transit center is in SANDAG’s 50-year plan, the region has already decided on that as the airport’s transit solution. “If the region were to decide on a different approach other than the ITC, the Airport Authority is committed to working with regional partners to make it a reality, both by contributing financially, where allowed by federal law, and by accommodating a transit connection onsite,” Heller wrote. A common request in the letters is for the airport to build a “people mover” on its property to the Middletown Trolley Station to improve that connection. MTS also asked for general upgrades to the Middletown connection, giving the 992 bus that runs from Santa Fe Depot to the airport its own dedicated lane on Harbor Drive, along with nicer bus stations and traffic signal priority. It also said there should be no problem paying for the Old Town shuttle. SANDAG also floated the idea of incorporating its aerial gondola plan into the airport’s transit offerings, with the airport paying for some needed studies. The Coastal Commission simply said the plan should include more robust transit offerings. The city of San Diego said the current plan, with little attention on transit but a proposal to build a 7,500-space parking garage (from which the airport could collect additional revenue) incentivizes driving over transit use, and therefore “conflicts with the city’s Climate Action Plan,” which seeks to discourage driving. “The plan fails to address any of the region’s larger transportation and mobility related issues, including the region’s interest in expanding transit to and from (the airport),” the Port wrote. CalTrans and the county, for their part, focus mostly on the need for better connections to the region’s highways. Along with complaints about how the Airport Authority will clean up problems from making the airport bigger and better, there’s another complaint littered through the agencies’ letters: that the Airport Authority is ignoring its neighbors. CalTrans said it “requested on several occasions” that the Airport Authority provide data it used for the environmental review, but never received it. That meant it couldn’t really review the Airport Authority’s work, it said. The city said it sent over a bunch of ideas it hoped the Airport Authority would include when the Airport Authority was getting started, but those ideas “were not incorporated into” the project. And the Port said many of the off-airport projects have been discussed in a multi-agency working group to improve traffic on Harbor Drive, but the Airport Authority chose to conduct its report before that group finished its work. The Port said it is eager to negotiate agreements to help fund those projects, but the Airport Authority hasn’t approached it or any other agency to start those talks. The Airport Authority rejects the idea that it hasn’t been a good partner. It points to that Harbor Drive committee and meetings it held with other agencies ahead of time to describe the scope of its environmental report. “In terms of coordinating with public agencies on this important project, the Airport Authority has gone above and beyond what is required by the state’s environmental review process,” Heller wrote.